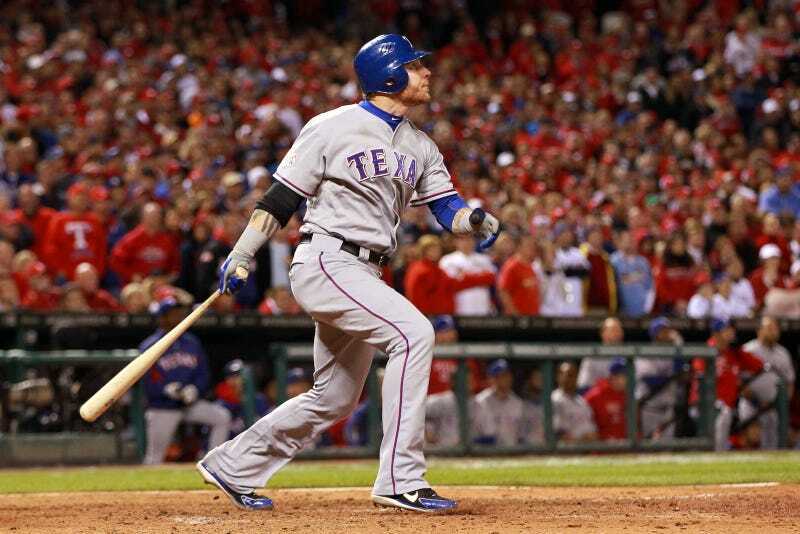 God likes to talk baseball with Josh Hamilton. In the dugout before the tenth, before what would stand as Hamilton's career-defining moment for all of a half inning, he heard a still, small voice. It told him Jason Motte would start him off with a waist-high four-seamer. "He said, you haven't hit one in a while and this is the time you're going to. But there was a period at the end of that. He didn't say, you're going to hit it and you're going to win." Hamilton said this before the assembled scrum of reporters, and he wasn't questioned or criticized or even scrutinized beyond "Yes, Josh Hamilton is a religious man." And that's fine, no one comes to baseball writers to discuss the theological implications of God being useful for in-play betting but not futures. But reporters and Anti-Calvinists should be worried about the implications of multiple players (Hamilton said he told his teammates before he went to the plate) knowing an outcome before it takes place. Where is the Yahoo investigative team now that Josh Hamilton admits to having a direct line to the big Arnold Rothstein in the sky? Where are Amy K. Nelson and Peter Keating with the outrage about God stealing signs from the bullpen? (He's everywhere, so presumably there too.) God has the dirt on Jason Motte and a host of other players, and he's not afraid to use it to give his favorites a leg up. Fay Vincent would have banned God from baseball, while Bud Selig stays silent. God's ways are mysterious. He kills firefighters and tips pitches; that's what he does. And just like Hamilton prayed for the family of Shannon Stone, he says he's going to pray before tonight's game 7. Only the Big Man knows if Carpenter's going to stay away from throwing his slider to lefties.